Colorado Springs Deck Builders™ was created by the owner of T Anthony Construction, Thomas Tellup. Thomas created Colorado Springs Deck Builders™ to showcase his creative work. Thomas started his career in the trades working for his father's remodeling company in Oxford, Ohio. Thomas's father taught him a wide range of construction practices with remodeling. This includes buildings well over one hundred fifty years old to constructing new builds. Thomas is a fifth generation carpenter influenced by one hundred combined years of experience. In 2001 Thomas moved to Colorado Springs to learn southwestern building at its best. Thomas worked for some of the best custom home builders in Colorado and again was influenced by construction practices most dream of having the chance to learn. Although this practice of building was very different, the basics were still the same which led Thomas to flourish in his field. In 2003 Thomas Started a remodel company called T Anthony Construction. Shortly after Colorado Springs Deck Builders™ was established. Thomas loves remodeling homes, and he loves building custom decks just as much. He knows Colorado Springs Deck Builders™ will create the custom deck you've been dreaming of. He will except nothing less. Colorado Springs Deck Builders™ is a custom deck contractor in El Paso county offering quality low maintenance custom decks. Colorado Springs Deck Builders™ uses only the best quality composites and framing materials. If you are looking for a custom deck contractor in Colorado Springs who offers quality decks for a competitive price then look no further. 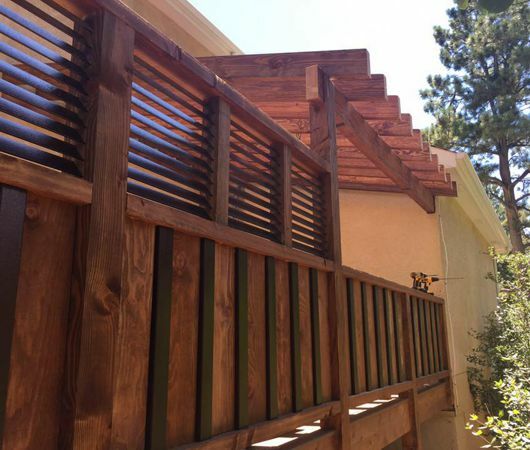 Colorado Springs Deck Builders™ is the right choice for your deck project.